If you're not convinced of the magic of spaghetti squash, you can still make this recipe to serve atop pasta or rice. Per Serving: 280 calories; 15g fat; 24.8g carbohydrates; 15g protein; 42mg cholesterol; 807mg sodium. Delicious! I love spaghetti squash but sometimes struggle with ways to jazz it up. I was super impressed with how this Tuscan version turned out. The spinach and tomatoes was perfect. Also, how can you go wrong with bacon? I think I have a new favorite! 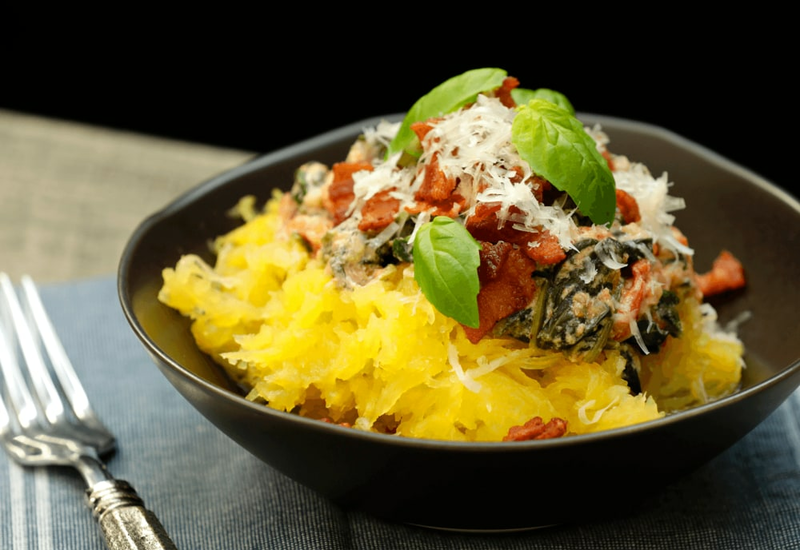 It took me awhile to really enjoy spaghetti squash, but this is so good! I did use heavy cream instead of half and half though Yes, extra fat but that's ok, it was yummy! I made a couple changes to this recipe like adding shredded chicken and using full fat coconut milk instead of half and half. It just felt like it was missing something, but the chicken helped make it a fuller dish. The recipe was really simple, so I loved that about it. I used regular angel hair pasta, and used the rest of the ingredients in the recipe to make a delicious Tuscan pasta. I also used cherry tomatoes cut in half instead of Roma, and an onion instead of shallot so that I didn't have to make an extra trip to the store. Turned out great!